If you live with dogs, your house is probably littered with dog gear. Dog toys scattered on the floor, food and water bowls, dog beds in every room — sometimes it appears that your dog is taking over. It’s time to take back your home, dog parents! Well, at least partly. 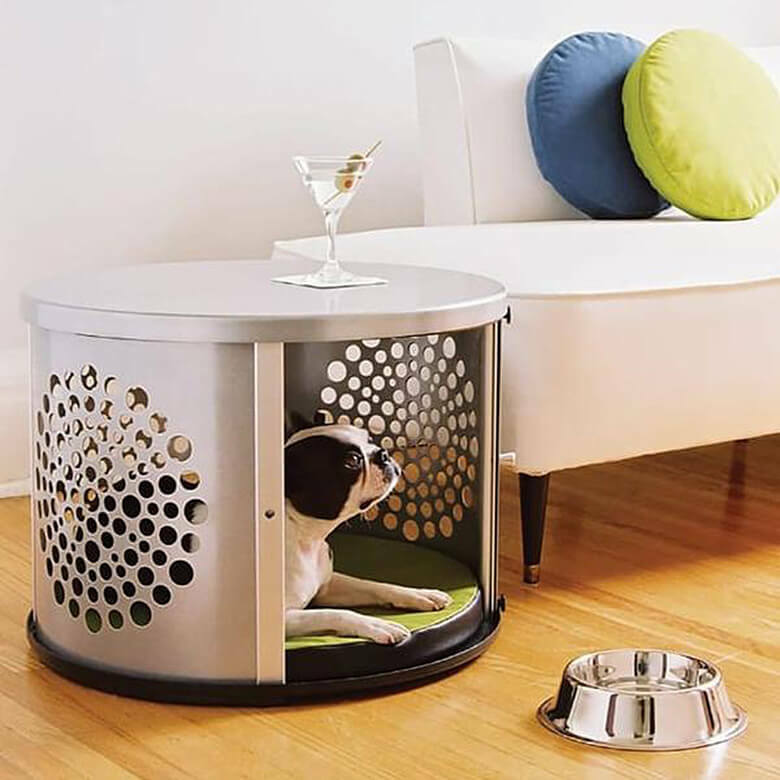 If your dog uses a crate, you can replace that ugly metal or plastic kennel with one that doubles as furniture. Here are some of the best and most beautiful on the market. 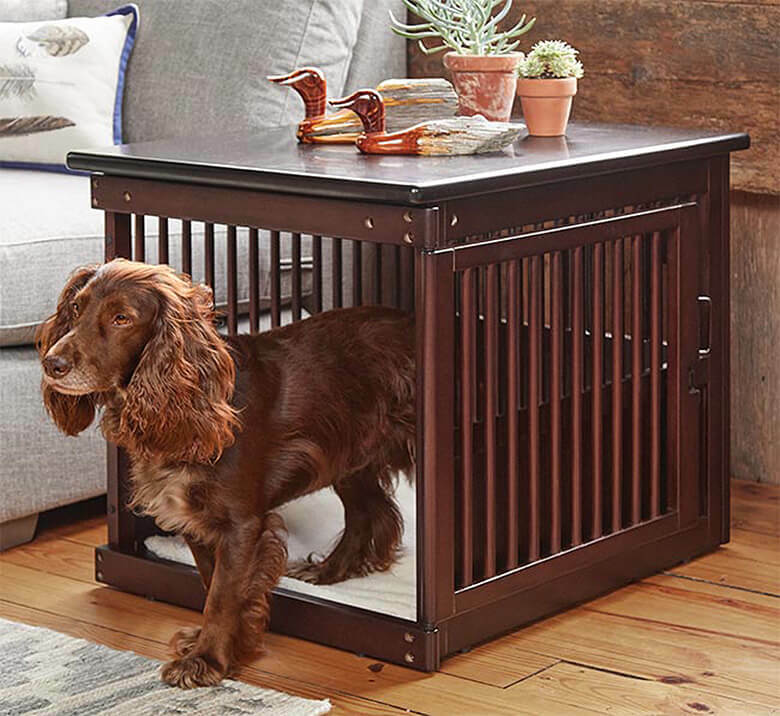 The wooden end-table crate by Orvis looks so good, if you don’t have a dog it might just inspire you to run out and adopt one! Constructed from sturdy wood, the wooden slats on the sides allow plenty of ventilation, while the solid top doubles as a side table for humans. The door can be left open by hooking it flat against one side, and the plastic pan on the bottom slides out for cleaning. Available in two sizes: Medium for dogs up to 44 pounds, and Large for dogs up to 88 pounds (for larger dogs, perhaps you should consider getting a barn!). 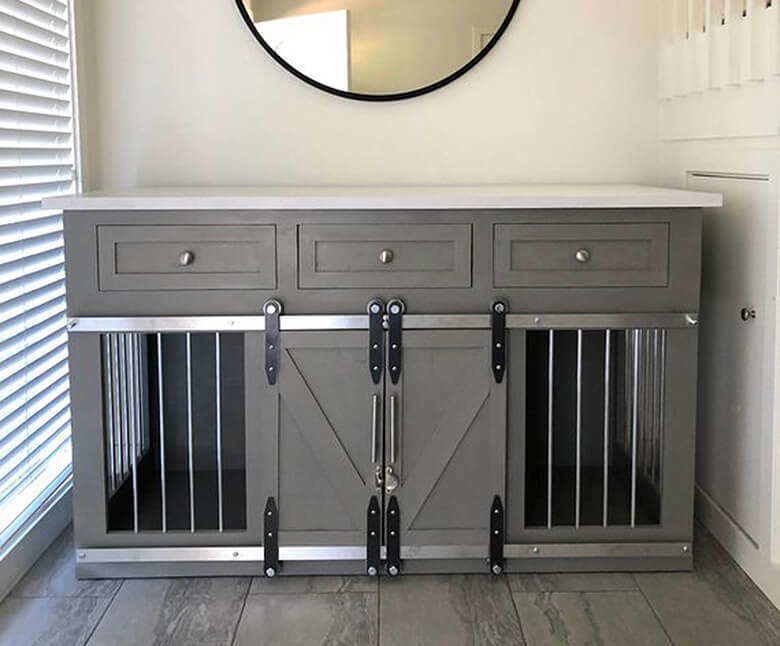 While DenHaus makes beautiful wooden crates for dogs, they specialize in modern, high-end crates that make your home look stylish. 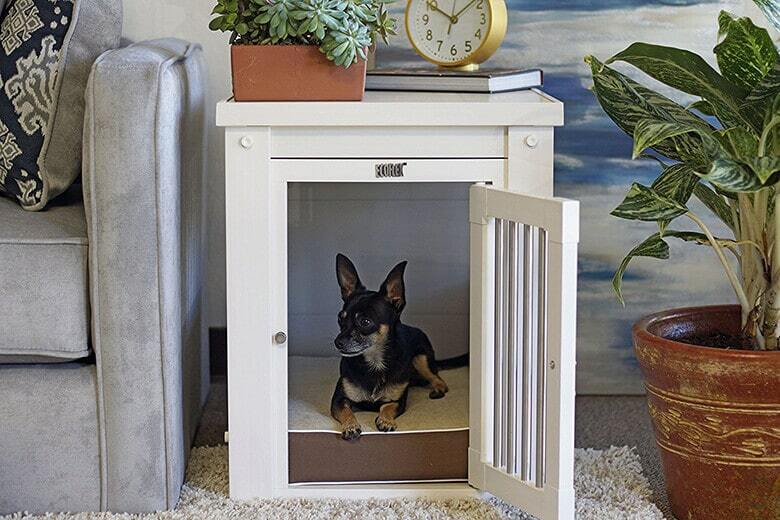 The Bowhaus dog den doubles as a striking end table. The round crate is made of durable fiberglass with a starburst cutout pattern on the sides for ventilation and a solid top for your drinks, glasses, or cups. The sliding door saves space by disappearing when open. Available in silver, red and black. 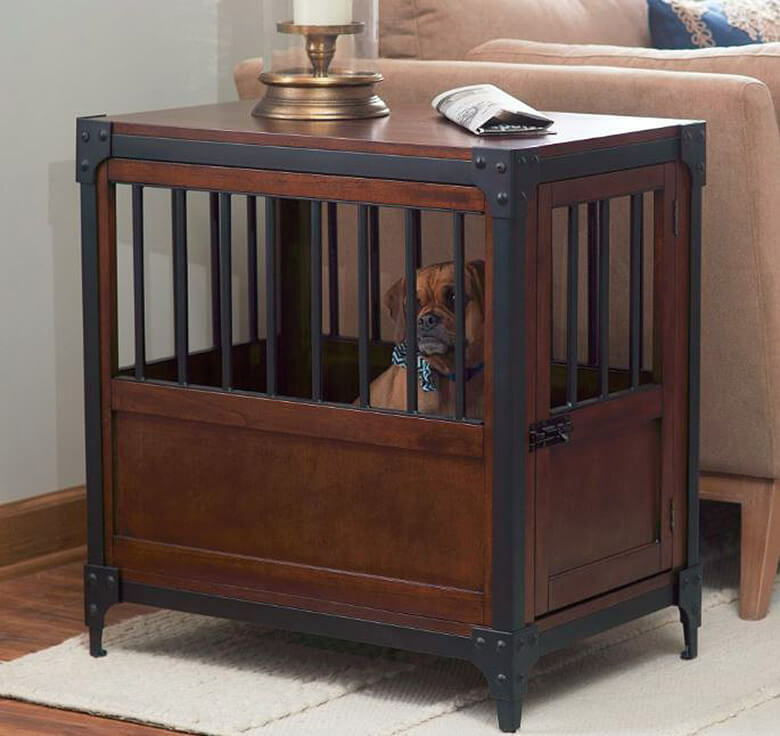 This Doggie Den is expensive, but if fine furniture is your jam, you’ll love this unique dog crate for two. Handcrafted and a little industrial, it’s made from solid wood with metal rods for ventilation. It adds a lot of character to your home as a unique console table, and you can even add drawers for extra storage. It’s customizable with seven wood finishes that include options from sleek to rustic, and you can choose different colors for the top of the table and the bottom crate. It comes with hand-turned legs that can be removed for those who want it to sit flat on the floor. And if you don’t like the idea of a crate built for two, you can order a custom design to get the crate of your dreams. Both the Single Doggie Den and the Double Doggie Den come in three sizes. The New Age Pet Habitat doubles as a mission-style end table. Made from durable ecoFLEX, a unique, eco-friendly composite of recycled polymers and reclaimed wood fibers, it features ChewGuard to prevent chewing the stainless-steel spindles. The top of the table has a wood grain, and the door to the crate is secured with a bone-shaped latch. Crate cushion is included. Available in four sizes and four colors. 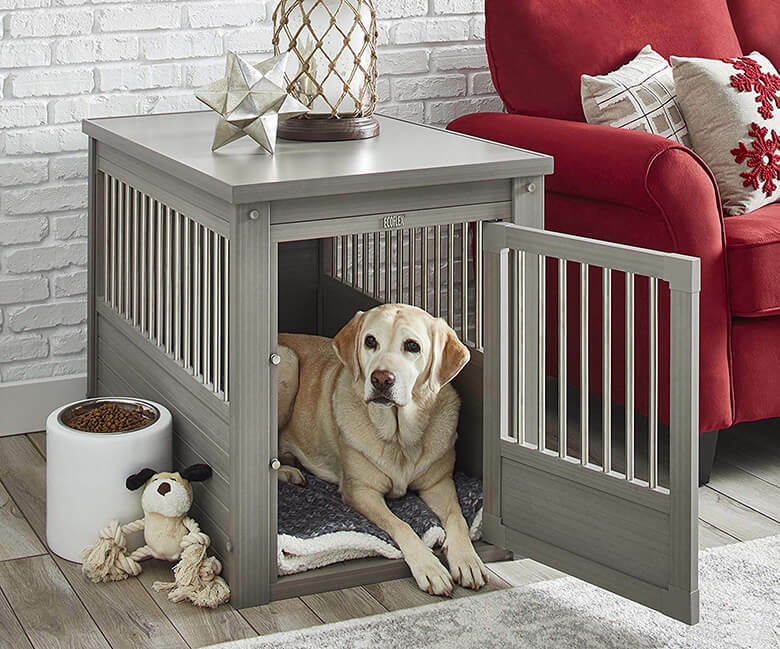 Good for dogs up to 35 pounds, the Industrial Style Pet Crate doubles as a very stylish and unique end table or night table. Made of engineered wood with metal accents, this crate provides plenty of ventilation in a sturdy, elegant design that has a downtown vibe. It can be locked with a solid metal latch. 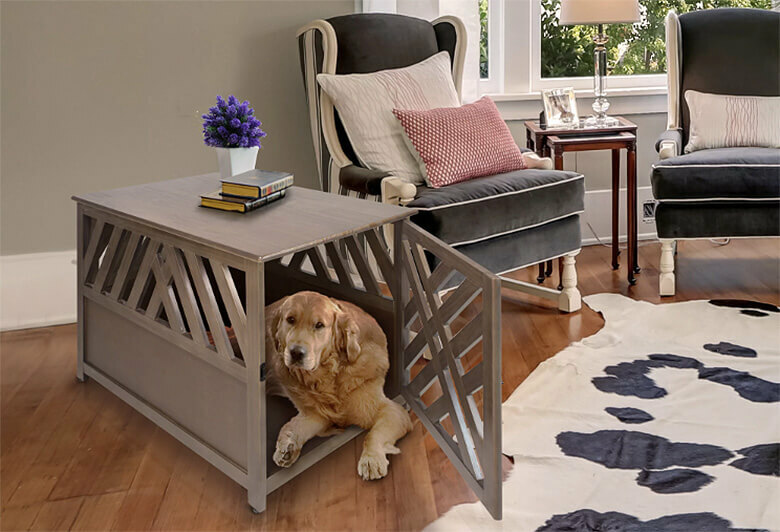 The Modern Lattice Wood Pet Crate is made from durable pine with a striking lattice design. Comfortably fits a Golden Retriever, it doubles as a stylish accent table. Easily cleaned with a damp cloth, it locks with a latch and has a roomy interior. It can easily be painted to match your décor. Available in light brown. 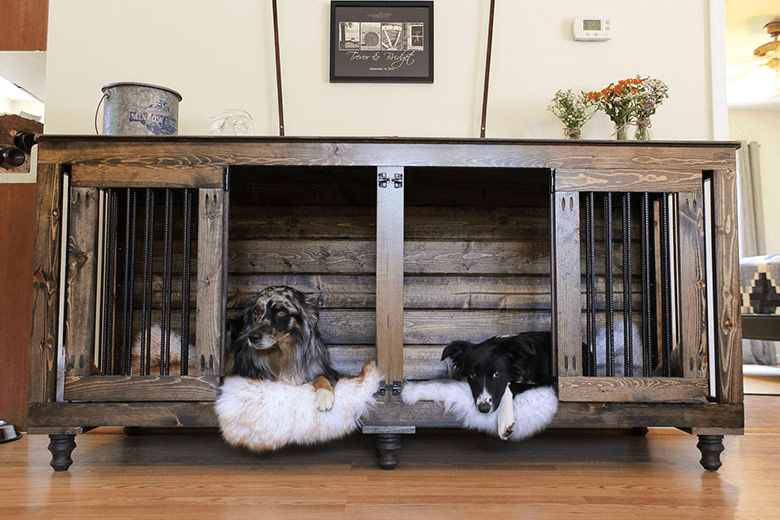 This dog crate from The Rustic Forest can double as a credenza or a media center. This unit is completely customizable to your specifications. The one used as an example has locking, sliding barn doors, three drawers, heavy duty ball bearing wheels, with door brackets that are waterjet cut. The door track and crate bars are aluminum for a unique appearance. Their crates are always solid pine wood and come in 26 different finishes. They can add mesh windows with steel frames to prevent your dog from chewing or to give it a more industrial look. The top can be butcher block or solid wood. Available in six standard sizes, starting at 36 x 25 x 44.